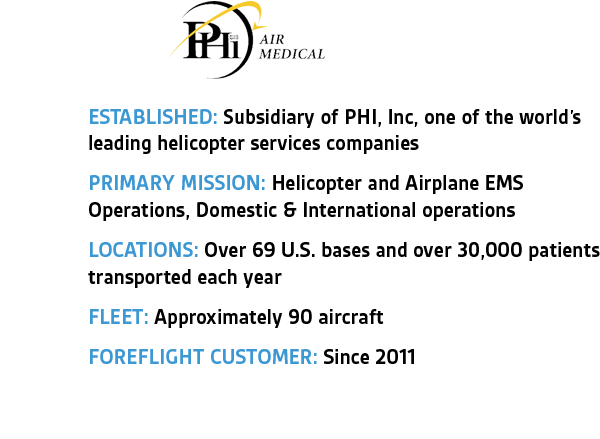 PHI Air Medical is the leading air ambulance provider in the U.S., operating out of more than 69 bases and transporting more than 30,000 people each year. With a steadfast commitment to providing safe and effective service to both the patients they transport and the communities they serve, PHI Air Medical is unwavering in its commitment to seek out and adopt the most efficient technology to both meet and exceed their flight planning and flying needs. I really think what ForeFlight has done has been very instrumental in making EFBs so widely used. 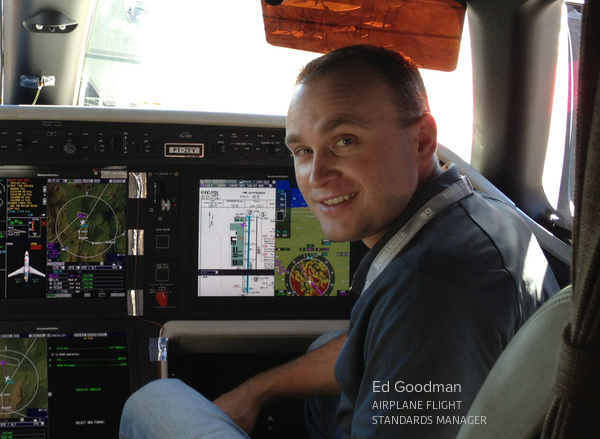 We caught up with Edward Goodman, Airplane Flight Standards Manager at PHI Air Medical, who has managed PHI Air Medical’s EFB integration program since the company first adopted ForeFlight in 2011. He shared with us some of the ways that PHI Air Medical uses ForeFlight to boost the efficiency and safety of their operations, and provided some advice for other operators seeking EFB approval. In general, how has technology shaped PHI Air Medical operations? EFB technology has allowed PHI Air Medical to simplify the management of required publications and Navigational Charts, while simultaneously lowering the recurring costs of managing these subscriptions. The time required for pre-flight planning and post flight paperwork has decreased and will continue to decrease as PHI Air Medical becomes more reliant on EFBs. What were the key objectives driving your EFB implementation? Our primary objectives were to improve and simplify our document and Navigational chart distribution, performance planning, and the documentation of manifests, while at the same time, improving pre-flight planning and adding inflight weather to aircraft without this feature. Leaving behind the problems that naturally come with paper charts, like missing approach charts out of booklets, was also an incentive. Everything about going paperless is better, so it’s been accepted very well amongst the pilot group. Many of these objectives were able to demonstrate that there was a good business case for going paperless. The outcome went especially well as we were able to deliver on what we had set out to do. Overall the switch was a positive experience. In regards to using ForeFlight, what capability has made the most impact on your operations? One of the biggest things for HAA operations is the Profile view — where you can draw a line across the map and view the highest obstacles. There’s a regulatory requirement for VFR HAA operators that mandates an analysis of terrain and obstacles along the planned route, and then fly at a minimum altitude above the terrain and obstacles. The Profile feature has helped our helicopter operations by allowing us to do that analysis in a simple and efficient fashion in ForeFlight. The graphical weather features that ForeFlight offers are top-notch. One of my favorite features is all the options you have on the Maps view for viewing temperatures, dew point spreads, weather conditions; all of this makes it a valuable application for weather and preflight planning for our pilots. Describe a time when ForeFlight played a critical role in a mission. Generally, it reduces the time required for preflight planning on a daily basis, especially on the helicopters where they’re using it in the decision making process using features like ceilings, dew point spreads, the Profile feature, etc. We also have a few Stratus units that we use in some of our fixed wing aircraft that don’t have inflight weather built in to the avionics. This can be a very valuable tool and serves as a cost effective solution to inflight weather. One thing I’ve always appreciated about the product is that ForeFlight does an excellent job of being innovative in the industry and providing a lot of new features and ideas. ForeFlight has been instrumental in making EFBs so widely used in the industry — it’s kind of changed aviation. Even when starting out as a small company, ForeFlight has always been a leader in the industry with your aviation products and what they do. ForeFlight does a fantastic job at not only implementing new ideas, but having products that actually work how they’re supposed to. I appreciate the quality product that Foreflight consistently produces. What advice do you have for other operators looking to deploy an EFB program? The best advice I can give is just follow the guidance in the Advisory Circulars. Following this guidance will give you most of the information that you need to successfully implement an EFB program at your company. Read through all the ACs and supplemental content that’s out there and get started on your validation period. Then during that process you can take care of the rest of the tasks and develop your standard operating procedures that you want to use with the EFBs. It’s much easier now than it was in 2011 when PHI Air Medical did it, but I still don't think there’s any quick shortcut to it. As long as you follow the information provided it’s not that hard, and it’s worth doing for the amount of work you put into it. FAA guidance has come a long way as EFB technology has matured. 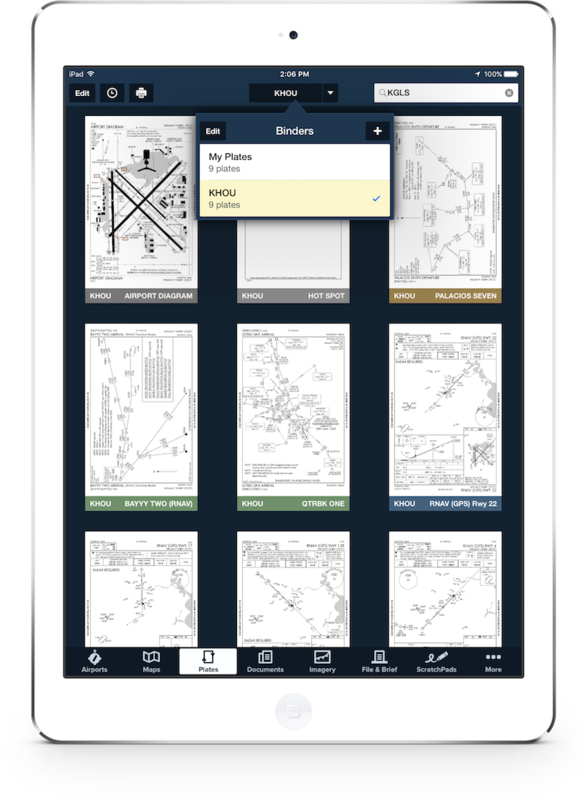 ForeFlight can supply you with a majority of the paperwork you need for your EFB approval, including checklists, rapid decompression test reports, and tools for surface ownship approvals.